“A super rare piece of vintage gear that sounds absolutely killer. For your consideration is this very nice all original example of a 1967-68 ?? Rheem Kee Bass analog synthesizer, serial number 2502-256. A great sounding monophonic piano bass synth featuring 25 keys, Tone, Fuzz, Mode (sustain), and Decay rocker switches, plus a variable Bass Booster transporter-style lever. Back panel has Fine Tuning and Level Adjust trim POTs with an old T.V. style power cable. all original, great looking and sounding vintage analog piano bass synth in perfect working condition. Synth is used and does have some small cracks in the finish of the face cover (see pics) but overall this thing is Excellent! No sound board/circuit board inside. “This listing is for a mid-late 60s Rheem Kee Bass keyboard. These are relatively uncommon little bass synths/combo organs. There is corrosion on the outside hardware, a couple cracks in the red plastic faceplate and some normal surface wear. The tolex is in good shape. This has just been serviced, which included replacing the electrolytic capacitors, cleaning the key contacts and pots, tuning, adjusting key action, and resoldering some iffy connections. The power switch has been hard-wired to the “ON” setting. Failed power switches are a fairly common problem with Rheem keyboards, and this was no exception unfortunately. Instead of replacing the switch with something that didn’t match I decided to keep it in and bypass the switch so the keyboard is on as long as it’s plugged in. ” Cosmetic: 7 as pictured. Auction Includes: 1 rheem kee bass w/case. “Rheem Kee Bass in excellent condition. Works well but a couple of low keys get sticky sometimes. Contacts probably just need a spray. Unit powers on and produces sound. Starting about the G key up, keys produce sound. Bottom E key is low and does not sit right. The tones it makes are intermitant and out of tune. The only rocker that seems to function is the fuzz on off. The bass boost slider also seems to work as it should. Theere are a couple small cracks in the upper red plate that dont show up in the pics. “PLEASE LET IT LIVE AGAIN!! IT NEEDS A LITTLE REPAIR, BUT I’M SURE A GOOD TECHNICIAN CAN MAKE IT LIVE AGAIN! !” Auction ended. Click here to browse on eBay. “I’m selling my Rheem “Kee Bass” Monophonic Analog Synthesizer. This keyboard sounds great and has that thick analog low-end that digital synths can’t quite match. It is fully functional and all keys, switches and controls work fine. It comes with the original cover and power cord — and as an added bonus, this is the same type of synth that appeared in Devo’s video for “Whip It!” (although I don’t think it was the synth used on the recording of the track)! The Kee Bass has switches for Bright/Mellow, Fuzz, Sustain/Percussion, and Slow/Fast Decay. It also has a super cool, star-trek-transporter-beam-style lever that boost the volume and the low end. Depending on which combination of switches you choose, this synth can get a mellow upright bass tone or a snarly sustain-y sound. The tone isn’t quite as funky as a mini-moog but it’s got it’s own quirky charm…maybe more Flaming Lips, Napoleon Dynamite, or Magnetic Fields than Bootsy Collins and P-Funk! The synth is fully functional. All the switches work cleanly and the analog output is loud and crackle-free. The black tolex case and cover are in good condition and untorn. All the keys work, although they can be a little glitchy sometimes depending on which combination of switches you choose (i.e., sometimes you have to press a key firmly to get the note to sound). I think this is more of a function of the analog design and also a due to the way that the synth handles the monophonic note triggering. That said, I’m sure the synth would benefit from a quick cleaning of the key contacts to make it even more responsive.” Auction ended. Click here to browse on eBay. Awesome Old School Bass tones!! sn:1306-114” Auction ended. Click here to browse on eBay. “For your consideration is this extremely nice 1960’s era Rheem Key Bass (number faded badge still intact). Fantastic all original example in perfect working condition with original AC cable. All keys work except for the highest note far right is silent. When first trying this lovely board several of the notes were intermittent from lack of use (dirty contacts) as we played it they all came back except the highest note. In other words maybe the silent key will come back as well. Flip switches all buttons and functions work perfectly. Great sub bass sound the fuzz is wonderful. These are notorious for being out of tune this one seems close. All badges and cosmetics are fantastic; original cover is missing half of a hinge otherwise clean and nice, closes and locks. Original AC cable in pouch is included. ” Auction ended. Click here to browse on eBay. 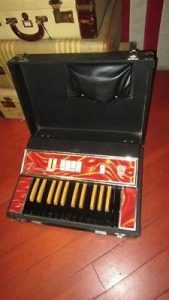 “Vintage 1960’s RHEEM “Kee bass” portable analog synth….sold for repair. Lowest price you will see for a Rheem Kee Bass. No Reserve Price. WYSWYG – What You See Is What You Get. If you have NO intention to pay, GO AWAY! Sellers such as myself depend on the extra income from eBay to survive (!) – now, on with the auction. Please be considerate. VG/EX+ shape. Unit powers up and plays. Half the keys don’t work. Sold for repair. Whatever it finishes at, it will sell for. Bid or bookmark now. ” Auction ended. Click here to browse on eBay. “Here is a vintage Rheem Kee Bass. Sounds and looks excellent! I would say Near MINT! Includes case cover and power chord.” Auction ended. Click here to browse on eBay. “Condition: Very Good – Has odd tuning problems, like the middle C forms a octave to the high B, etc., and notes sometimes self-modulate when pressed. Otherwise, all notes play and rocker switches work. Cosmetically in Very Good condition.” Auction ended. Click here to browse on eBay. “I am selling my wife’s vintage Rheem Kee Bass. This keyboard was made in the 70’s by the same company that makes heat and air supplies. This keyboard was made to sound like a string bass and was used by some of the rock bands in the 70’s instead of guitar bass. This unit sounds great and my wife used it for several months on the road as we played music in the south on tour this past winter. She has now purchased a split keyboard so she can play bass and regular keyboard on the same unit. This unit looks great and is a cool 25 key bass. Notice the color of the keys is reversed from a regular keyboard. All of the buttons and parts work good. It hooks directly into your bass amp with a regular 1/4″ instrument cable. It has the complete original case to carry and protect it. Power cord is included.” Auction ended. Click here to browse on eBay. “This is a monophonic, 25-key bass keyboard synthesizer with a 1/4″, unbalanced output. The case, keys, and power cables are all original to the instrument. There’s no structural damage to the instrument or it’s case. There are a few cosmetic cracks in the plastic, which are pictured. All the keys, controls and connections function normally. This instrument has tone, fuzz, mode and decay switches (pictured) that lend a fair amount of variety to the tone. It can also be routed through effects pedals or processors.” Auction ended. Click here to browse on eBay. “Vintage 1960’s Rheem Kee Bass. Made in Japan. This synthesizer has been fully tested and is in great working condition. All keys, buttons, bass booster, on/off, output, light, level adjust, fine tuning, latches and handle work as they should. Cosmetically, it is very good condition. There are a few cracks in satin flame wrap and the case has a normal amount of wear for its age. This unit has a modified switch that creates even darker synth tones and huge monophonic bass sounds.” Auction ended. Click here to browse on eBay.